Personal income is the total of wages, business profits, investment earnings and transfer payments like Social Security and pensions, and in Idaho that total jumped 3.9 percent from 2011 to 2012. Per capita personal income – that total divided equally among every man, woman and child – was $34,481 in 2012 in Idaho – 79 percent of the national average of $43,735. Idaho’s per capita income has been steadily declining in relation to national per capita income over the past decade, dropping from 83 percent in 2002 when it ranked 40th among the 50 states to 49th among the states in 2012. 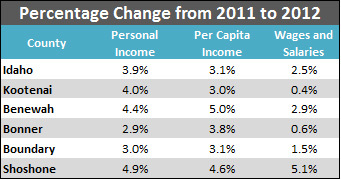 During the same period, personal income and per capita income increased for all five northern Idaho counties. The largest increases were in Benewah and Shoshone counties, where there was a significant increase in wages and salaries. Compensation and bonuses from the mining industry was most likely the source in Shoshone County, and earnings in local government probably explains the growth in Benewah. In 2012, Kootenai County’s per capita income was $34,656, ranking 17th among the 44 counties at 101 percent of statewide per capita income. That was an increase of 3 percent from 2011, just short of the statewide increase of 3.1 percent. A decade earlier per capita income in Kootenai County at $25,166 ranked 11th among the counties. The county’s 2002-2012 compound annual growth rate was 3.3 percent compared to 2.7 percent statewide and 3.2 percent nationally. Net earnings accounted for 64 percent of total personal income in 2002 in Kootenai County. By 2012, that portion dropped to 58 percent with transfer payments and investment earnings generally picking up the difference. Transfer payments have grown at a compounded annual rate of 7.9 percent over the past decade in the county compared to the 7.5 percent statewide 6.3 percent nationally. This, at least partially, reflects the increase in Kootenai County’s 65 and older population, which rose from 12.6 percent of total population in 2002 to 15.4 percent in 2012. Kootenai County experienced nominal growth in wages and salaries from 2011 and 2012 compared to the other northern counties. This entry was posted in Employment News and tagged economy, idaho department of labor, idaho economy, Northern Idaho, per capita personal income, personal income on February 18, 2014 by Idaho Department of Labor.